Honestly, who cares for Christmas wreaths at this time of year, huh? I was going to post a round-up to share some of the inspiration I found here and there. But yesterday I managed to crochet my first granny square and this is real news. I have been trying to crochet for ages. I have used all the free stuff up on the web, watched every single video several times, followed every step by step and whatnot. To no avail. I was stuck on my sofa with a foundation chain on my crochet hook, just as a Hogwarts student who would have missed the train. 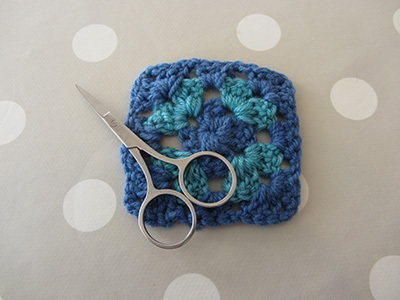 – How to crochet a granny square by Catherine Hirst. Catherine explains simply which stitch goes where and does what, plus the video is made with an angle allowing to see quite well how it is done. 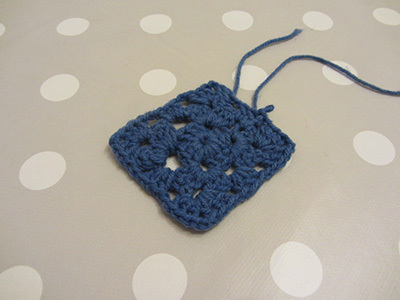 – How to crochet, granny square, lesson 1 to 5 by Beth. The full process is divided into several 5 minutes video and Beth shows us how she makes the granny square in real time and shares some really useful tips. This video made the whole process real clear to me. I have to confess crochet is great. I am over the moon as I now have some very portable craft project to take with me on my Christmas break. I have checked Ravelry and it turns out you can also make extra cute creatures in crochet. And little bags. And scarves. And hats. And so on. For now I have to take deep breathes, calm down and focus on my first crochet project: the granny squares blanket. I will use yarn in all kind of blue shades I have found in my stash. It will be perfect for the sitting room. Mwouhahaha. Then I may find some time to finish the 538 other knitting projects I have on at the moment (including Christmas gifts). And time to make stuff as I am to hold a stall at a Christmas fair in 3 weeks. 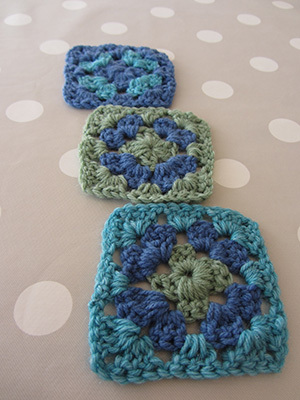 Or could I sell granny squares? Re mwouhahaha. Next time I may tackle the difficult matter of Christmas wreaths. Or could I make a granny squares Christmas wreath? Hey Helen, thank you so much for showing me the moves, I wouldn’t have found out from the books and videos. Happy to see the Poncho is coming along well! I love your granny squares and the blues are beautiful. I, like you, have been teaching myself to crochet and also used catherine’s video. I found it very easy to follow and her book is good too. Keep up the good work! Hi Sara. I am a fan of blue anyway, but I particularly love those. I didn’t know Catherine wrote a book, worth checking out. Thanks for the tip!